Wow time sure catches up on you fast, recently my blog had its 6 year anniversary. It feels like much less than a year, probably because of how busy I’ve been. This year I’ve obviously been doing less writing, mostly because of how busy family commitments are keeping me at the moment. It’s not all bad, as only posting once a month has allowed me to spend more time on each one, and I’ve made a few minor improvements to the layout and writing as a result. I’ve only got one motherboard left for that series of posts and I’ve finished the graphic library bench marking, so I’m contemplating what new stuff I’ll make. I’ve been considering making a short series revisiting my old BASIC programs one at a time. Not sure how this will work out, or how interesting it would be to readers, but it’s some thing I’d be keen to do. A series for teaching programming to absolute beginners is another idea, which I’m considering producing in a video format on youtube. It would require a bigger time investment, but would probably work better than the written form. I’ll continue writing about MS-DOS games, largely because there’s plenty of material left, and I quite like writing the posts. I’ve got some shorter term hardware posts in mind as well, such as a few system overviews and revisiting some of my neglected machines that haven’t had a run in a while or are in need of repair. The Sparcstation 20 is one such machine, I have already written the first post, but unfortunately I’ve had difficulty getting packages to build under system emulation with Qemu and NetBSD 7.1 as there are occasional unexplained freezes. I have the X11 server enabled which may contribute to that, so I might try disabling that, a different version of Qemu, or perhaps running the build on the actual hardware instead. Before I wrap up, just a quick comment on something I’ve seen happening on Ebay. I sometimes peruse the vintage computing sections and couldn’t help but notice that some machines are being parted out (dis-assembled and parts sold individually) to the point where even screws are being sold individually. I’m in two minds on this, I can understand doing this for something that is broken, but still has some usable parts. On the other hand I would be really unimpressed if people did this to otherwise working hardware. It appears this is happening sometimes. Also unimpressive is when sellers label their common as mud machines such as the spectrum and C64 as rare even when they are anything but. I’ll wrap up here before I launch into a rant about how hard it is to find retro hardware here. Big thanks to any regular readers and commenters. 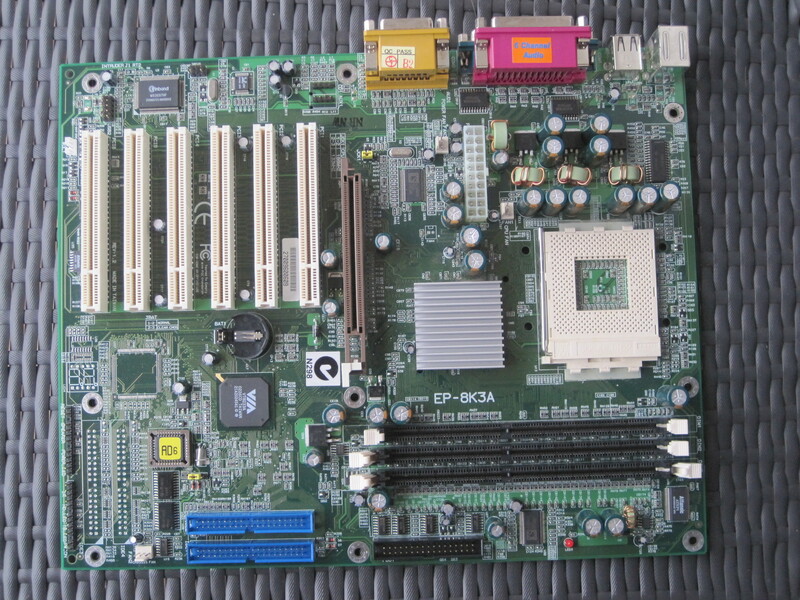 Today’s motherboard is a Socket 462 board (also known as Socket A) it is an EPoX EP-8K3A made in early 2002. The CPUs that fit this socket type have an exposed die that makes direct contact with the heat sink, this is generally good for heat dissipation, but makes installing or removing a heat sink a risky business. Here’s a photo of the board. 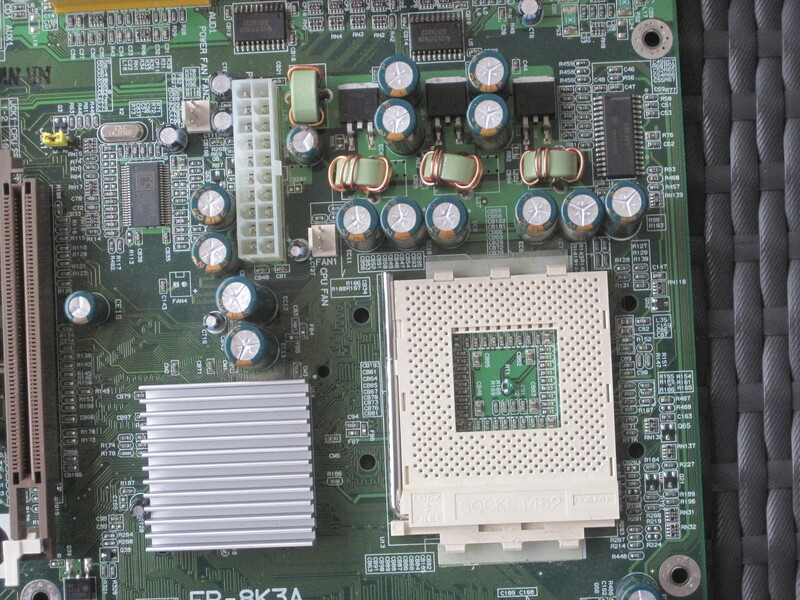 The board has a VIA KT333 chip-set, which at the time was one of the first to support the then new DDR333 standard. VIA chip-sets were very common at the time, especially where AMD CPUs were installed. An interesting feature was it’s ability to run the memory and FSB clocks asynchronously, although in practise this wasn’t that useful. If the memory was slower it became a bottle neck for the entire system. If it was faster the CPU wouldn’t have been able to make full use of the extra bandwidth, although that bandwidth could be used by other devices such as a graphic or sound card. Also noteworthy is the fact that this is a single memory channel board, later systems made use of the dual channel architecture which had a memory bandwidth advantage. It has the usual suspects as far as peripherals go. It has a HDD/FDD controller, Serial/parallel ports, two USB ports, AC97 audio and a game port, which would have covered most users needs at the time. It lacks on-board LAN and USB 2.0, which would have been nice to have, but are easily added via the 6 PCI slots. There were two models, one had extra IDE ports connected to a RAID controller along with a diagnostic module that displayed the status on a two digit seven segment display. I have the board without these extra features, which doesn’t worry me as I can add a RAID card if needed. EPoX was known for making boards for the enthusiast and over-clocker, and this board doesn’t disappoint on that front. You can see the voltage regulation circuitry has more capacitors and chokes than contemporary boards. They called this three-phase, but that’s not really a good description, basically it has three separate voltage regulator circuits just for the CPU core voltage. This results in a power supply with less noise on the line, and with the larger capacitor bank it also handles spikes in workload/power drain better. It probably increased the boards reliability over the long term, even if you didn’t over-clock. I found a review of the board that was written at the time it was released that has more details. By the time this board was made jumpers were mostly a thing of the past, with everything under software control in the BIOS settings generally. 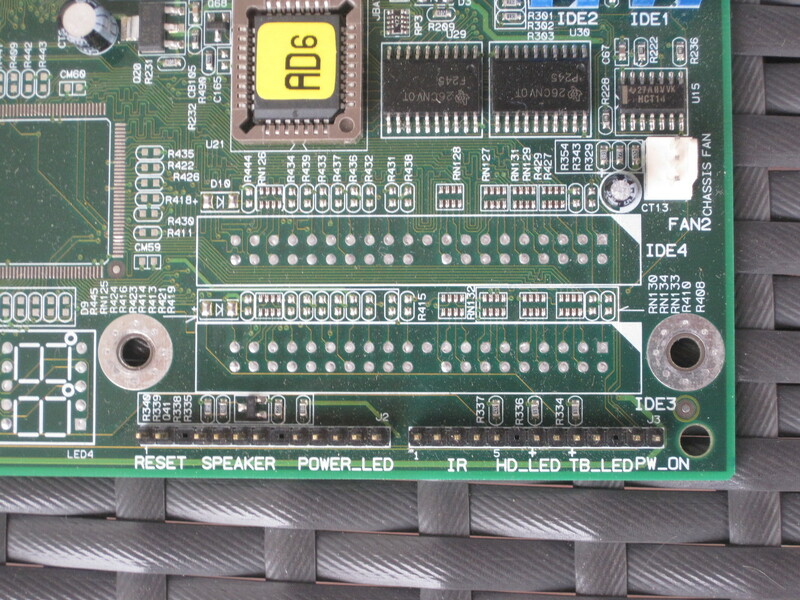 With the front panel connectors clearly marked this board would have been quite easy to install and set up for an end use. This board would have been favoured by technicians partly because of this, but also because it would have almost certainly been more reliable, was fairly cheap, and was even forward compatible with processors and RAM that was yet to be released. For end users this would have been a great work horse board for anyone, it is cheap, reliable, and has extensive upgrade options. However now as an old board, there are better socket A boards from the era with more features, better compatibility and faster chip-sets more capable of over-clocking. It would still be good in a vintage PC build, but not for a high performance machine of the era.